Sending out religious Christmas cards can be a gamble. When you are sending holiday cards for business it is usually best to be more generic and include everyone. 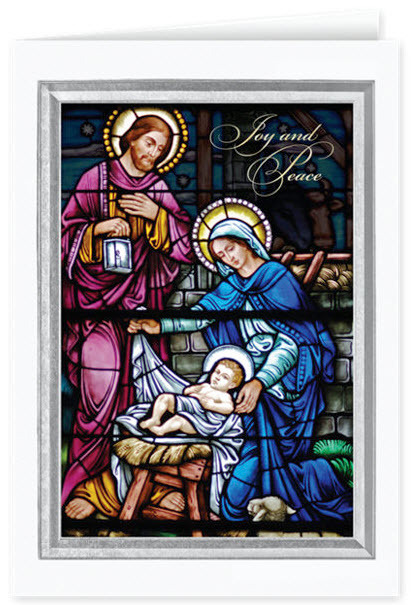 “Season’s Greetings” and “Happy Holidays” are the sentiments normally sent out , especially for corporate cards. It is understandable, especially for businesses, that the sender would not want to offend any of their recipients. But when it comes to personalized Christmas cards, I think most people are aware that Christmas is a religious holiday, and sending out a religious card is an acceptable way to recognize it. In fact, sending out a religious card, or at least one that actually mentions Christmas, is perfectly acceptable for those of you that want to share your holiday greetings with friends and family alike. If someone sends you a card for a holiday you don’t celebrate, it is not meant to insult, but rather to simply share the spirit of the season. Picture yourself receiving a card from someone wishing you a “Happy (insert holiday you don’t celebrate)”! Your reaction would probably be less “How dare they!” and more “That was nice of them to think of me.” So if you come across a lovely religious Christmas card that you would love to send and share, chances are the recipient will be happy to share the spirit in which it was sent. Almost everyone gets into the holiday season even if they don’t celebrate Christmas. Noone should be offended to receive a religious card. One should simply look at it as it was nice that they thought of me. I don’t consider myself an overly religious person, but I love receiving holiday cards whether they are religious or not. agree that from a business stand point, one should keep the holiday cards generic. For personal use however, I love receiving religious cards. The card designs are beautiful. I can’t wait to see the holiday cards that I will receive this year. To me, Christmas will always be a religious holiday – not the commercial holiday it seems to have become. Jesus is the reason for the season. I do undertand the necessity of using Seasons Greetings in a business setting but I am not too happy about it. I always send Merry Christmas cards to my friends and family and when ordering my business cards they say Season’s Greetings but they will always have a symbol of Christmas – a tree, a star, a wreath, an ornament, etc. It doesn’t matter to me if the card is religous or if it has Santa or a snowman or a Christmas tree on it. The fact that the person sending it thought of me and that’s what makes it special. To avoid the gamble I send Thanksgiving cards and I make mention of the Holiday Season. I do business with people of all religions and even some with no religion so I have always wanted to play it safe.